Tropical Disturbance INVEST 97W has appeared more organized overnight as it quickly makes its way across the Philippine Sea towards Luzon. 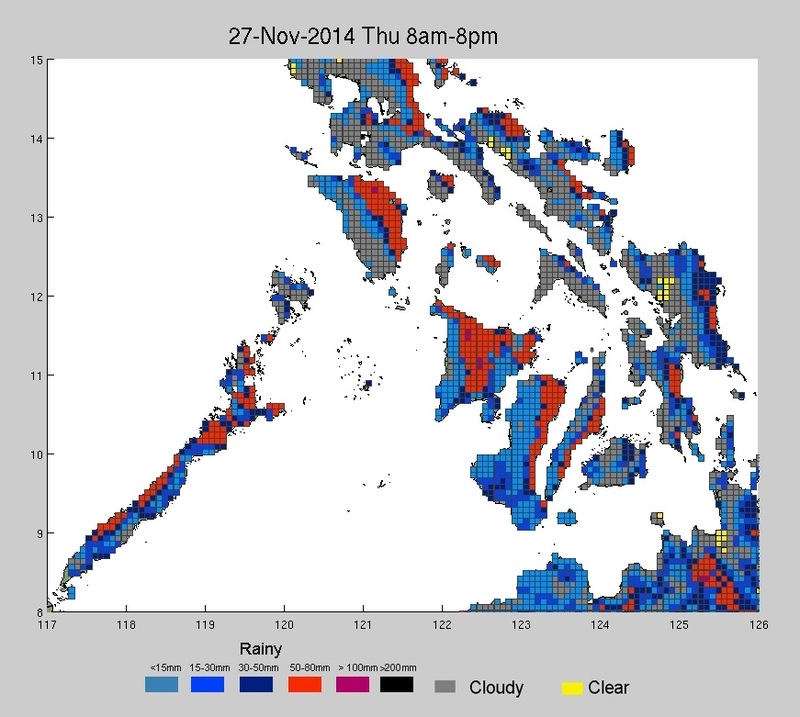 Rainfall associated with the system has begun to affect areas in the Eastern Visayas and Eastern Bicol Region. THE AREA OF CONVECTION PREVIOUSLY LOCATED NEAR 8.2N 133.7E, IS NOW LOCATED NEAR 14.2 126.2E, APPROXIMATELY 300 NM EAST OF MANILA, PHILIPPINES. RECENT ENHANCED INFRARED SATELLITE ANIMATION INDICATES PERSISTENT DEEP CONVECTION ASSOCIATED WITH A DEVELOPING LOW-LEVEL CIRCULATION CENTER (LLCC) RAPIDLY MOVING TOWARD THE NORTHWEST. A 251926z 91GHZ SSMIS PASS INDICATES DEEP CONVECTION WRAPPING AROUND THE NORTH AND NORTHWEST SIDE OF THE BROAD LOW-LEVEL CIRCULATION THAT HAS NOT COMPLETELY CLOSED OFF ON THE SOUTHERN FLANK, LIKELY DUE TO THE RAPID FORWARD MOTION OF THE SYSTEM. THE UPPER-LEVEL ENVIRONMENT IS FAVORABLE FOR DEVELOPMENT WITH FAIR OUTFLOW THAT MAY IMPROVE AS THE SYSTEM NEARS A MID-LATITUDE JET. VERTICAL WIND SHEAR IS ESTIMATED TO BE A LIGHT 10-15 KNOTS. 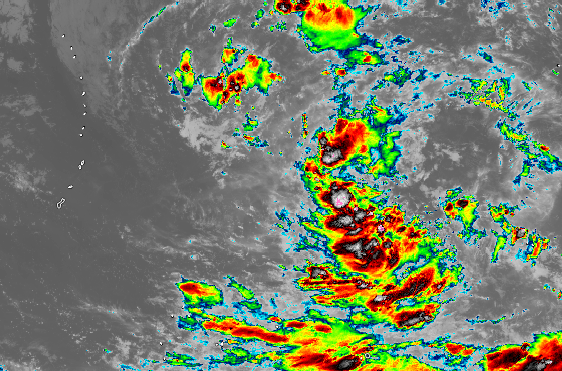 GIVEN THE FAVORABLE ENVIRONMENT, A TROPICAL CYCLONE COULD FORM QUICKLY IF THE SYSTEM SLOWS DOWN ENOUGH FOR THE CONVECTION TO ORGANIZE AROUND THE LLCC. GLOBAL MODELS ONLY INDICATE A WEAK CIRCULATION MOVING INTO LUZON IN THE NEXT 24 HOURS. MAXIMUM SUSTAINED SURFACE WINDS ARE ESTIMATED AT 17 TO 22 KNOTS. MINIMUM SEA LEVEL PRESSURE IS ESTIMATED TO BE NEAR 1006 MB. DUE TO IMPROVED CONVECTIVE ORGANIZATION AND FAVORABLE ENVIRONMENT, THE POTENTIAL FOR THE DEVELOPMENT OF A SIGNIFICANT TROPICAL CYCLONE WTIHIN THE NEXT 24 HOURS IS HIGH. 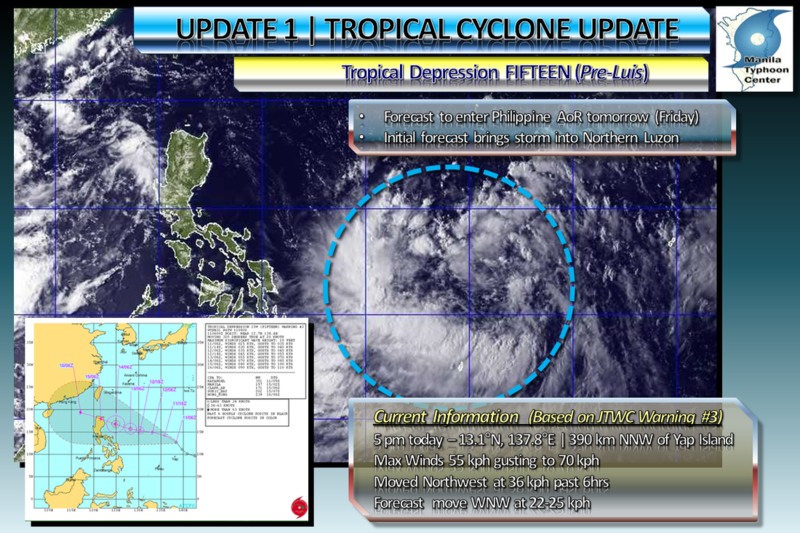 INVEST 97W has been located at 14.2N 126.2E, about 225 km East-Northeast of Catanduanes. Bearing 18-23 Knots (33-43 KPH) winds, the system is forecast to move to the West-Northwest towards Luzon. Areas in Luzon should expect rainfall in the coming hours up until the next 2-3 days as the system approaches land. Orographic (landmass) effects could increase rainfall amounts, especially areas near mountain ranges. Manila TC has the disturbance having a medium chance (56%) of becoming a Tropical Cyclone within the next 24 hours. 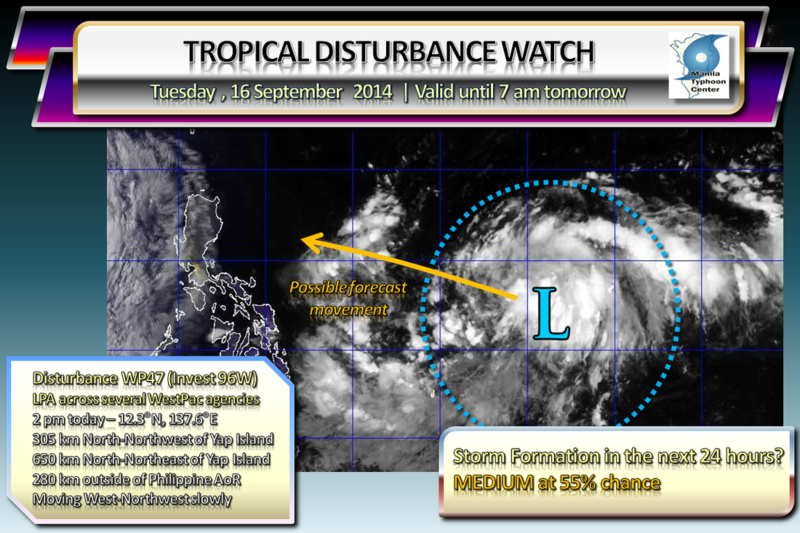 The area of convection (Low Pressure Area) being monitored by Manila TC has further organized overnight and is now subject to a Formation Alert, meaning the system could become a Tropical Depression within the next 24 hours. The Joint Typhoon Warning Center has rated Invest 91W as Medium. An upper level low is providing an outflow channel to the system, thus aiding its development, Rainclouds from the system are now causing showers in the Southern Marianas Islands. Forecast Model support is good, with the system tracking over Guam/Marianas Islands in the coming days before making a track through the Philippine Sea. Whether Invest 91W will affect the Philippines remains to be seen as some model runs indicate a recurve towards Japan in the far future, thus long-range track forecasts confidence are very low. Update: NRL has designated the system as Invest 91W, with JTWC assessing the system as LOW for development. A broad disorganized area of Low Pressure is now being monitored for signs of tropical development within the next 24 hours. The said area is embedded within the Monsoon Trough (ITCZ), and is currently located roughly near the Western part of the Marshall Islands Chain. 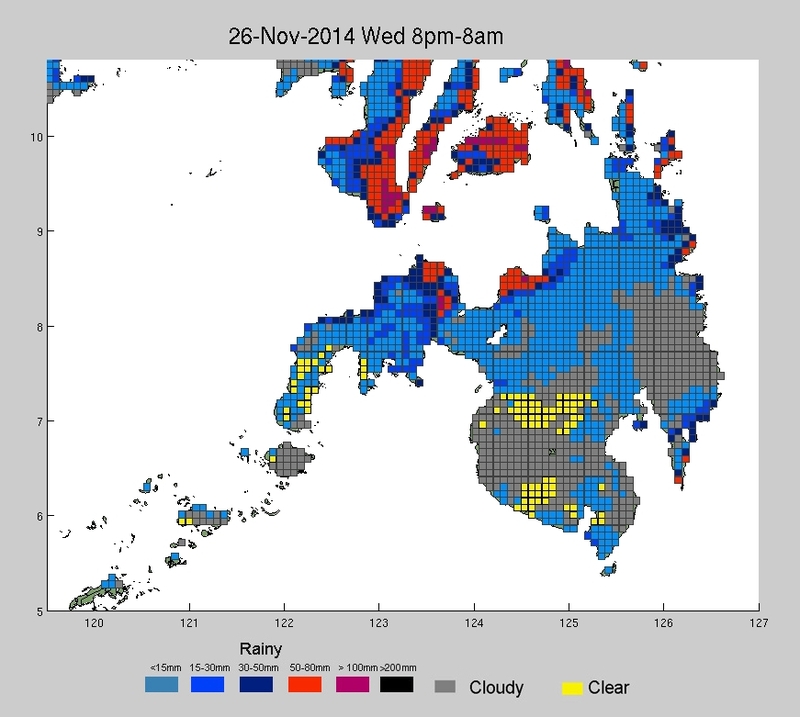 JMA-Japan, KMA-South Korea, US NWS-Guam, and CWB-Taiwan show this LPA on their weather maps. Latest runs of numerous Computer Forecast Models are giving hints of Tropical Cyclone development within this Monsoon Trough, with a system passing near Guam or the Southern Marianas by next week. ManilaTC analyzes this un-numbered disturbance at having a Medium or 50% chance of development within the next 24 hours. As the national weather bureau, PAGASA has made revisions in the Public Storm Warning Signals in adding Signal number 5 for the Super Typhoon category, Manila TC has also made timely revisions in the page. In an effort to inform the public on what to expect on every storm signal, we have put much detail in each signal warning. With the impending landfall in a few hours of Typhoon Amang (yes, JMA and JTWC has upgraded the system into a Typhoon) over Eastern Visayas, Manila TC will now begin its live blog coverage of the storm. Manila TC is keeping watch on a disturbance south of Guam at this time. This develops as the nation prepares for the visit of the leader of the Catholic church, Pope Francis over the weekend. 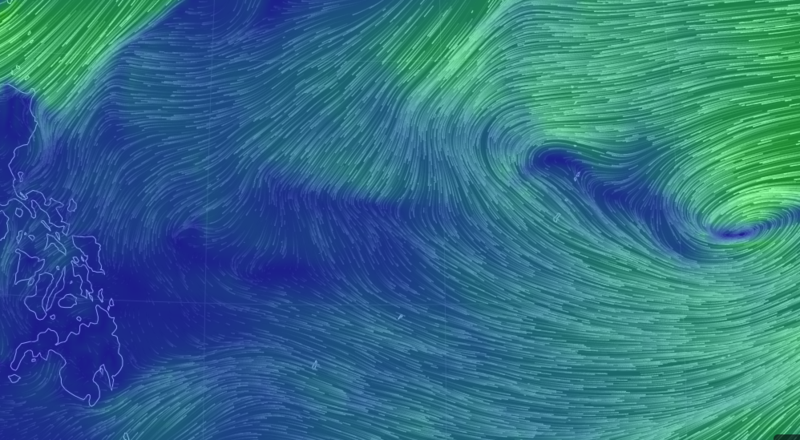 Invest 92W currently is tracking West with winds within the system reaching 35 kph. Majority of computer forecast models are consistently hinting this to become a Tropical Storm as it tracks into the Philippine Sea. We will give a full update this morning. A TYPHOON WATCH REMAINS IN EFFECT FOR FAIS AND ULITHI IN YAP STATE. 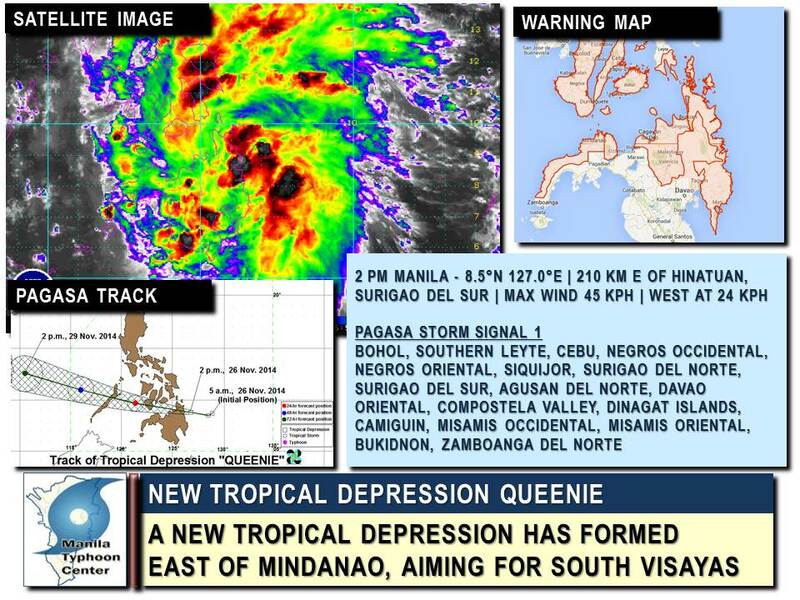 The Tropical Disturbance to the east of Mindanao has been upgraded by the PAGASA into a Tropical Depression and was named locally as Queenie. 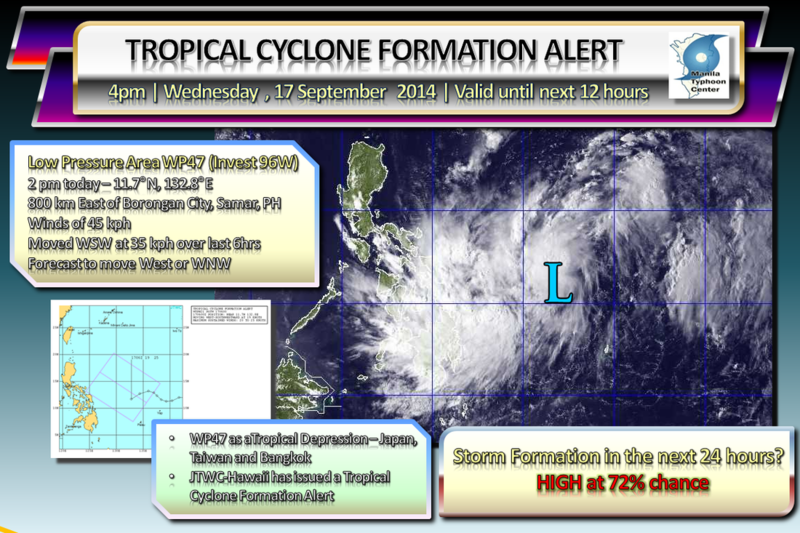 The 21st Tropical Cyclone for the year is about to cross into Northern Mindanao this afternoon and tonight. Potential for heavy flooding rains are expected across Mindanao and Southern Visayas today and tomorrow as TD Queenie crosses the region. PAGASA has raised Storm warning signal #1 over much of Northern Mindanao and Southern Visayas. Rainfall forecasts from Weather-Manila's rainfall models are indicating light to moderate rainfall across Southern Visayas and Northern Mindanao during the night time hours and becoming moderate to heavy during the daytime hours tomorrow as the tropical system passes. Residents along these areas are advised to keep watch of potential flash flooding and landslides as land lifting (orographic) effects are expected to increase the rain intensity. TD Queenie (21W) is expected to track West, make landfall across Surigao provinces today and cross into Southern Visayas before emerging in the Sulu Sea and Palawan later on. The disturbance east of the Samar/Bicol area has shown more development over the past 12 hours as it tracks towards the Philippines. JTWC-Hawaii/NRL has designated the system as Invest 96W. LPA WP69 (Invest 96W) now has winds of 35kph (20kts) and is moving West at 27 kph. All Weather agencies in the West Pacific consider the system as a LPA, and the JTWC gives the system a medium chance to develop in 24 hrs. 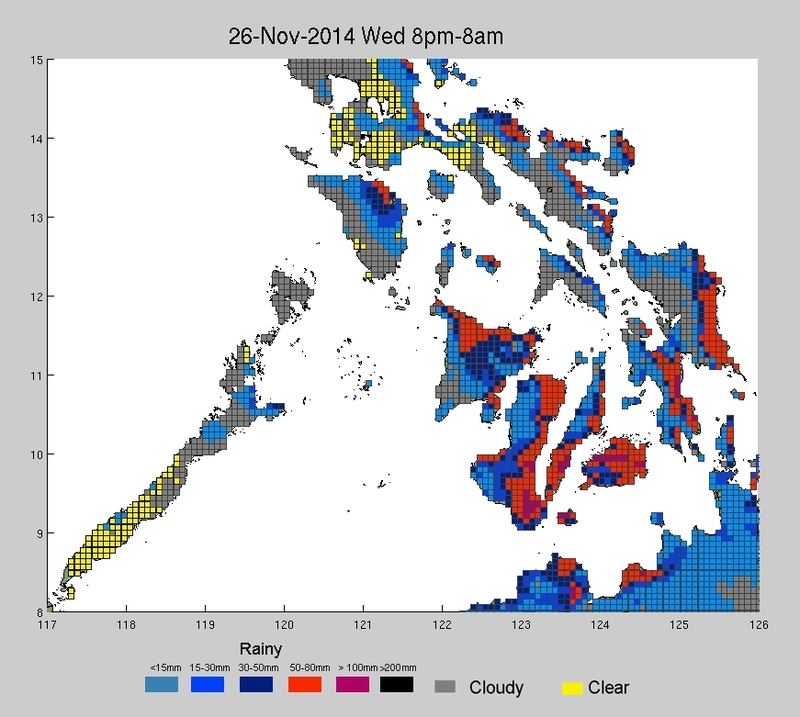 The system is forecast to enter the Philippine Area of Responsibility by tomorrow afternoon or evening. Currently, computer forecast models are giving forecasts to develop LPA WP69 (Invest 96W) and possibly track into Luzon by early next week. All interests in Luzon are advised to keep watch and monitor the progress of this system. Check out Manila TC's affiliate ongoing LIVE WEBCAST regarding Typhoon Vongfong at www.westernpacificweather.com, featuring NHK World Meteorologist Robert Speta! 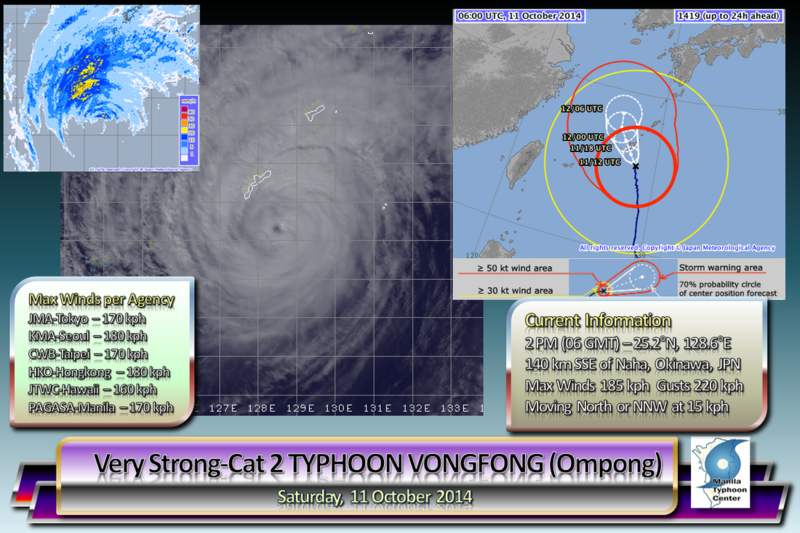 Typhoon Vongfong (Ompong) is now making its slow, gradual approach to Okinawa island. Landfall is now expected to occur during the late evening hours of Saturday or early Sunday morning. Kadena AirBase in Okinawa is now in TCCOR 1 Emergency, meaning: Winds of 50 knots sustained or greater are occurring at a particular installation. All personnel will stay indoors away from windows. Outdoor movement will be restricted to lifesaving response actions. Okinawa Island has been being hammered by the Typhoon with wind gusts exceeding 60 knots (110 kph) being experienced already, with 12 hours from landfall. Forecasts for the island are winds gusting up to 185 kph expected later tonight as the eye passes through. Meanwhile, Typhoon Vongfong (Ompong) is now outside the Philippine AoR, with the eye crossing the 25 degrees north latitude line. 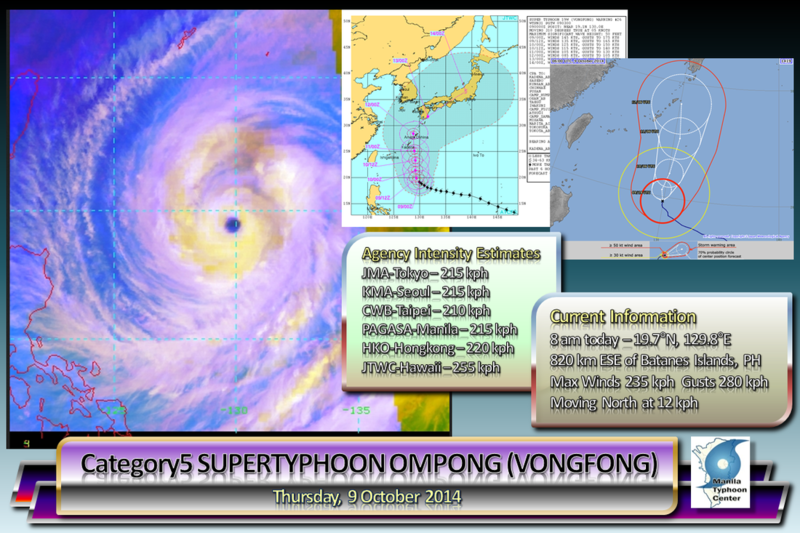 The strongest tropical cyclone of the year (as of this writing), Super Typhoon OMPONG (Vongfong) is now laying its sights on the southern islands of Japan, the Ryukyu Islands. The howler has begun to make its trek Northward and is possibly already past its peak intensity. As it passes near Okinawa, the Typhoon is possibly between a Cat 3 or 4. The typhoon will not directly affect the Philippines, but rough seas may be experienced by seafarers along the Eastern seaboards of Luzon and Samar. Based on current analysis, the potential of LPA WP47 (Invest 96W) to form into a Tropical Cyclone over the next 24 hours is now HIGH at 70-80% chance. ManilaTC is now issuing a Tropical Cyclone Formation Alert for the Low Pressure Area to the East of the Samar Islands in the Philippine Sea. Meaning that the likelihood of this system to become a Tropical Depression is now possible over the next 24 hours. At 2pm today, LPA WP47 (Invest 96W) is located 800 km East of Samar, moving to the West-Southwest at 35 kph. Outer rainclouds of this system have begun to affect the Visayas and Mindanao regions. Should PAGASA upgrade this system, it will be locally named as MARIO. Then if it reaches Tropical Storm strength, it will be named internationally as Fung-Wong. This alert will be valid until the next 12 hours, and will be reissued or cancelled or upgraded depending on the status of the system. 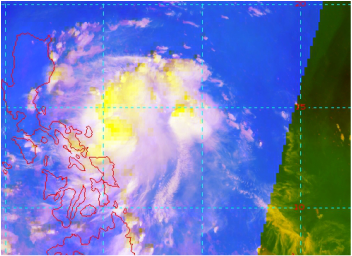 ManilaTC is now monitoring another Tropical Disturbance -- 280 km Outside the Philippine Area of Responsibility, east of Samar Island. Disturbance WP47 (Invest 96W) has shown more organization over the last 12 hours. It is currently drifting to the West/WNW and may enter the PAR tonight or early tomorrow. Forecast models are mixed on developing this system. ManilaTC will keep monitoring the system and will post the next update tomorrow, unless major developments occur. We have activated the live blog page on the Manila typhoon center Weebly site, for the latest updates on Typhoon Luis. A new Tropical Depression (15W) has formed far to the East of the Visayas today. This system is poised to enter the Philippine AoR late today or early tomorrow and will be locally named "LUIS". 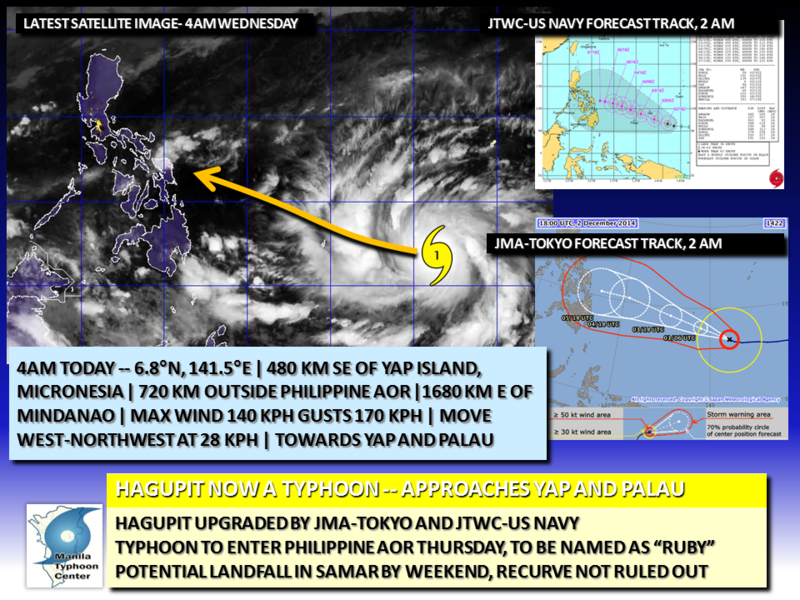 The JTWC in Hawaii has released its third warning on the system, while PAGASA-Manila has included in its advisories. The storm has been located 390 km North-Northwest of Yap Island, and is forecast to track into the North Philippine Sea towards Northern Luzon by early next week. 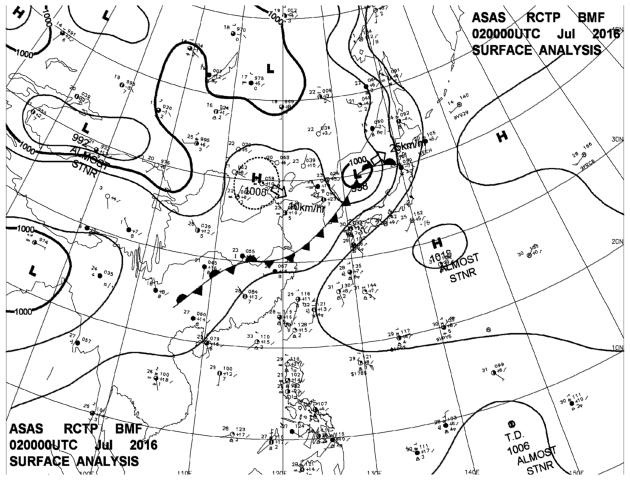 JMA-Tokyo still considers the system a LPA. Interests in Luzon and Taiwan should monitor this system as it continues to develop. The potential of Disturbance WP04 to develop into a Tropical Cyclone within the next 24 hours has been DOWNGRADED TO FAIR with 40% probability. The Low Pressure Area WP04 (93W) in the vicinity of Chuuk has remained disorganized over the last 24 hours. WP04 (93W) is struggling to keep intact in the midst of high vertical wind shear over that area. At 8 am today, the circulation center of WP04 (93W) was located at 4.1°N, 153.2°E, about 390 km South-Southeast of Chuuk Island or 1390 km Southeast of Guam... with 15kt (25kph) winds within the system, WP04 (93W) has remained stationary. Computer models have depicted the system to strengthen and track more towards Guam and the Marianas Islands later next week as a weak tropical depression or storm. Given the long range nature of the forecast and how the models initialize the system, this forecast remains uncertain. The potential of Disturbance WP04 to develop into a Tropical Cyclone within the next 24 hours remains at MEDIUM with 50% probability. The main focus of this update remains the area of low pressure located near Guam and Chuuk Islands in the Pacific, namely LPA WP04 (Invest 93W)... Numerous agencies in the Pacific are still keeping watch on the system as it remains stationary over the last 24 hours. This morning, LPA WP04 (93W) is located just near Chuuk island, about 1750 km outside of the Philippine AoR. The system remains stationary and is forecast to drift West-Northwest over the next few days, possibly drifting much closer to Yap State than to Guam in the coming days. LPA WP04 (93W) has been encountering high amounts of wind shear in the upper levels, disrupting its organization... but the shear has shown signs of relaxing in the coming days. And given the high sea temperatures, LPA WP04 (93W) may move into an area of favorable conditions next week. The Low Pressure Area WP03 (Invest 93W) has remained persistent around 850 km Southeast of Guam bringing showers in the Micronesian Islands. The system is considered dissipated by the JTWC in Hawaii in its last advisory, but ManilaTC still considers the system as active as most of the agencies in the region still carry the system. Meanwhile, JMA-Tokyo has mentioned in its latest advisory this afternoon that a new tropical wave/disturbance has been found south of the Marshall Islands. ManilaTC shall be designating it as 05D, as the system is still quite new. GFS remains the most bullish of the major computer models available in hinting that a tropical system to form near Guam by the end of next week perhaps going into the month of March, it remains to be seen if the other models say otherwise as well. Again we maintain that the track and chance of formation is still very much uncertain, given the long range nature of the forecast and how the models initialize the system. The potential of Disturbance WP04 to develop into a Tropical Cyclone within the next 24 hours remains at MEDIUM with 48% probability. 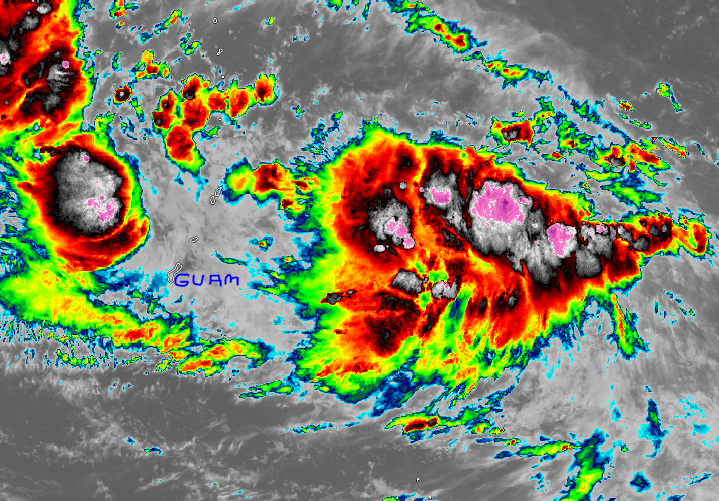 Tropical Disturbance WP04 remains disorganized over the Micronesian Islands as it drifts Northwest towards the Guam. 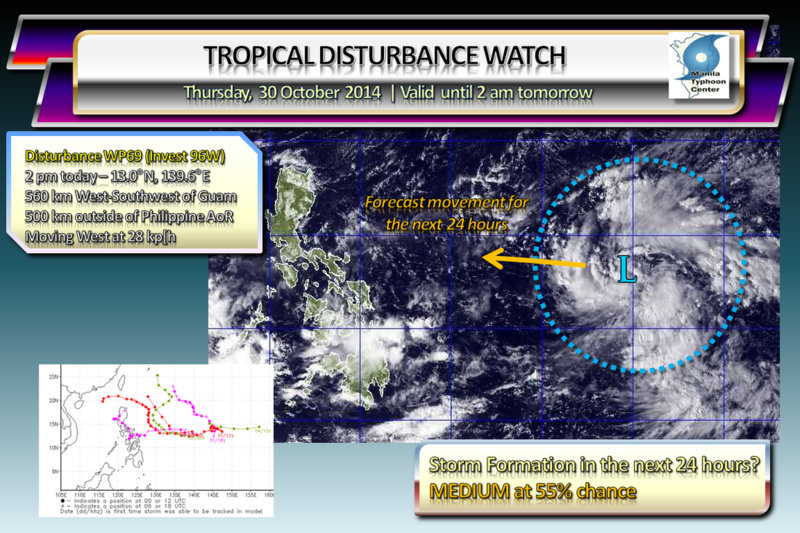 The disturbance is currently located at 7.5°N, 151.2°E at 2pm today... Intensity has not changed much as the system remains at 15 knots (25 kph)... The disturbance is currently moving slowly in a generally NORTHWEST direction. Manila TC remains on watch as long-range forecast models are hinting at developing WP04 in the coming days. The GFS model remains the most aggressive with WP04 developing near Guam near the end of next week. The potential of Disturbance WP04 to develop into a Tropical Cyclone within the next 24 hours is at MEDIUM with 51% probability. Please take note that the track and chance of formation is still very much uncertain, given the long range nature of the forecast and how the models initialize the system.